This cope, a cape-like vestment worn at Christian church ceremonies, was originally part of a voluminous chasuble, the principal vestment worn by the priest for the celebration of Mass. It is now known as the Syon Cope and takes its name from the Bridgettine convent of Syon in Middlesex, which was founded by King Henry V in 1414-15. It is probable that the nuns took the cope with them when they went into exile during the reign of Elizabeth I and that it was returned when the Order was re-established in England in about 1810. On the original vestment there would have been four rows (on the reconstituted cope there are three) of interlaced quatrefoil shaped compartments with scenes from the Life of the Virgin and the Life of Christ and the Apostles; the latter, seen in the fourth dismembered row, are not identifiable. Between the compartments are six winged seraphs and along the upper edge are the remains of angels holding crowns and the figures of two kneeling clerics, possibly representing the priest for whom the vestment was made. They hold scrolls with undecipherable Latin inscriptions. Unique among surviving examples of opus anglicanum (the Latin term for English work, which was the high quality English embroidery known to have been bought by princes and popes), the ground is entirely covered in red (now faded to brown) and green silk thread. The orphrey bands (decorative strips) with heraldic shields around the circumference and along the top edge of the cope are made from pieces of contemporary vestments. These may be purely decorative. The embroidery is worked in silver-gilt and silver thread in underside couching, split, cross and plait stitches and laid and couched work. 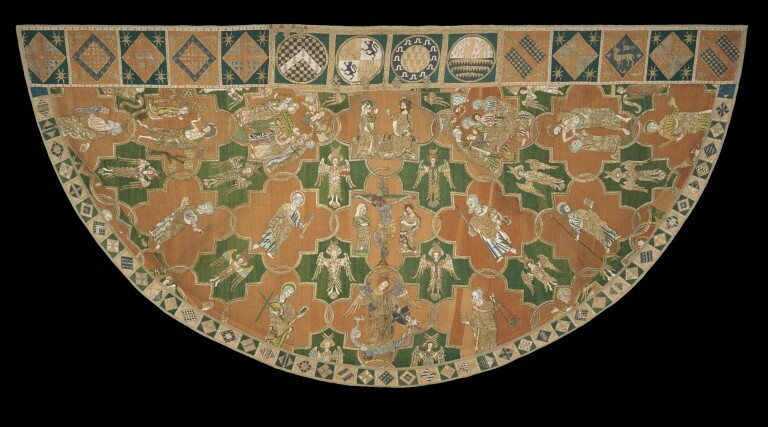 Linen embroidered with silk, silver-gilt and silver thread in underside couching, split stitch (figures), laid and couched work (the background), showing scenes from the Life of Christ and the Virgin, and standing apostles. 1. Down the centre back, the Coronation of the Virgin; Christ Crucified, with the Virgin and St. John; the Archangel Michael with the dragon and a distinctive shield with a green cross on a red ground, the figure of Christ in silver (reminiscent of a crucifix in hard materials). Relative to the other scenes, St Michael is large. 2. To the left: the Burial of the Virgin with St. Thomas receiving the Virgin's girdle; Christ appearing to St. Mary Magdalene; St. Peter with a key; St. Philip with three loaves; St. Bartholomew with a flaying knife and St. Andrew with a cross. 3. To the right: the Death of the Virgin; St. Paul with a sword; the Incredulity of St. Thomas; St. James the Great with a pilgrim's staff and a purse embroidered with a scallop shell; St. Thomas with a lance and St. Simon with a club. Fragments of what was originally the fourth row, which was cut away when the chasuble was remodelled as a cope, are incorporated in the sides of the vestment, showing heads and shoulders of unidentified apostles. Between the quatrefoils are six-winged seraphs except along the upper edge, where there are the remains of angels holding crowns and the figures of two kneeling clerics. They hold inscribed scrolls. The right hand cleric has worn away so that the base linen with the drawn outlines ready for embroidering is visible. Tiny remnants of thread that was originally silver has worn away to show its white silk core. The orphrey bands and morse are made from pieces of contemporary vestments, presumably added when the chasuble was converted into a cope. 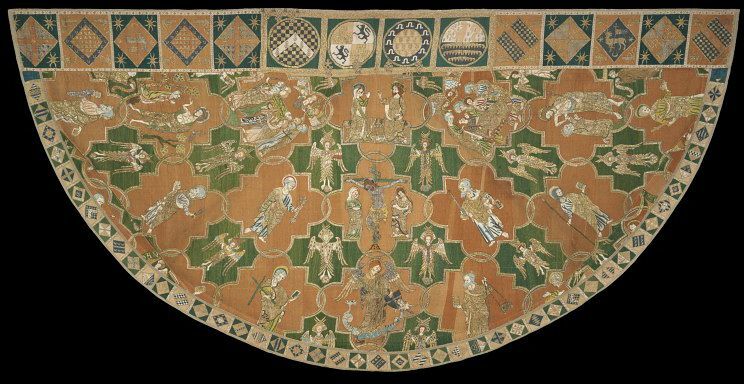 The orphrey round the circumference consists of the remains of a stole and maniple with armorial lozenges on squares of red and green alternately. 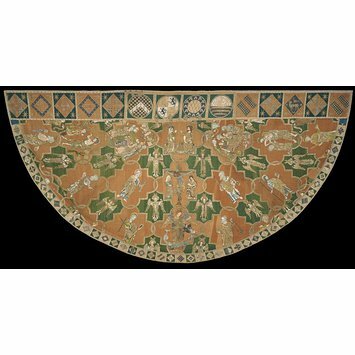 The main orphrey is composed of three joined alb apparels. The morse has had one section cut off. On the one edge of the morse is a decorative braid configuration that looks like frogging. It is echoed on one side of the cope at morse-level. All are of linen embroidered with silver-gilt and silver thread and coloured silks in underside couching, cross and plait stitches. The red and green of the grounds of the quatrefoils have faded considerably so give no impression of what the dominant colour might originally have been, though the disposition of each suggests that red dominated. They are now light green and a soft pinkish orange. The inscribed scrolls of the kneeling clerics are mainly indecipherable. The Syon cope takes its name from the Bridgettine Convent of Syon in Middlesex, which was founded by Henry V in 1414-15. The cope appears to have been in the possession of the nuns when they went into exile early in the reign of Queen Elizabeth. They settled, after various wanderings, in Lisbon, and it was returned when the Order was re-established in England in about 1810. It subsequently passed through the hands of the 16th Earl of Shrewsbury, Dr Rock and Bishop James Browne, and was then purchased by the Museum. An "alternative" Portuguese version of this history suggests that the cope had been in the Mocambo convent (Lisbon) from 1588 and was sold by the nuns in 1842. (Luis Keil, Boletim da Academia Nacional de Belas Artes, Vol. XIV, 1945, pp. 42-3. Keil was the chief-curator of the Museu Nacional de Arte Antiga in Lisbon). Late in 2005 Hugo Xavier provided us with this information. The armorial devices on the orphrey bands and morse may have been purely decorative since they refer neither to related families nor even to people alive at the same time. The design is closely related to the wall paintings at Westminster Abbey. The designer of the cope must have been familiar with the paintings, which are earlier than the embroidery, and are ascribed to Master Walter of Durham, who worked at Westminster Abbey in the late 13th century. Historical significance: This cope is the only known example of opus anglicanum in which the background is entirely worked in coloured silk (in other cases a woven silk material was used, or the whole background was embroidered in gold on linen). The major pieces of opus anglicanum that survive are nearly all copes, probably because the cope was a grand processional garment suitable for a gift from a nobleman to a Pope or prelate. In reference to the time required to complete similar embroideries, Mabel of Bury St Edmunds was commissioned by King Henry III to work on a chasuble in gold, pearls and silk, which seems to have taken three years to complete, probably with three or four embroiderers working on it simultaneously. The vestment is not in its original form,as it was made as a chasuble, not as a cope. When it was converted into a cope, the orphey bands and morse were added. The chasuble is the principal vestment worn by the priest for the celebration of the Mass and was bell shaped. The semi-circular cope is worn for various church ceremonies, and fastened across the chest by a brooch or strip of material called a morse. The great period for opus anglicanum lasted from the second half of the thirteenth century to the middle of the fourteenth, and hence coincided with the upsurge of cathedral building in the country. The bulk of the work was produced in professional secular workshops, most of them in the City of London. These workshops were generally directed by men, and the workers, who included both men and women, were expected to serve an apprenticeship of seven years (like other craftsmen). Nothing is known of the designers of the embroideries. Underside couching seems to have been much more extensively practised in England than elsewhere, but went out of use during the first half of the 15th century. The technique involves the metal thread laid flat on the ground material and fixed at intervals by being pulled through to the back of the work secured by a linen thread, thus improving the flexibility of embroidery which might otherwise be rigid. Both silk and gold threads, and silk or silk velvet background materials had to be imported into England from Italy or the Near East (much high-quality gold thread came from Cyprus). The split stitch is ideal for expressing emotion and for capturing the spirit of a scene. Medieval church art was greatly concerned with the pictorial representation of biblical stories, this was a way of teaching an illiterate population. Some form of framework was necessary to regulate the design and set off the scenes and figures, as the vestments were often covered all over with embroidery. Cope with scenes from the Life of Christ and the Virgin. King, Donald & Levey, Santina, The Victoria & Albert Museum's textile collection: embroidery in Britain from 1200 to 1750, (London: Victoria & Albert Museum, 1993), pl. 8 and 9. Williamson, Paul (ed. ), The Medieval Treasury: the art of the Middle Ages in the Victoria and Albert Museum, (London: Victoria & Albert Museum, 1986), p. 190-191. Christie, A. G. I., English medieval embroidery, a brief survey of English embroidery dating from the beginning of the tenth century until the end of the fourteenth, (Oxford: The Clarendon Press, 1938), cat. no. 75. Catalogue of English ecclesiastical embroideries of the XIII to XVI centuries, (London: Board of education, 1930), p. 9 and pl. I -VI. Houston, Mary G. Mediaeval Costume in England and France. The 13th, 14th and 15th Centuries. (New York: Dover Publications Inc., 1996 - reprint of original text of 1939), pp. 32, 70-71. Farcy, Louis de. La Broderie du XIe siècle jusqu' à nos jours. Angers, 1900, pl. 19. Textiles in the British Isles, c.450–1450. (Leiden and Boston, 2012), pp.569-70. Robinson, John Charles (ed. ), Catalogue of the Special Exhibition of Works of Art of the Mediaeval, Renaissance, and More Recent Periods, on Loan at the South Kensington Museum, June 1862, exhibition catalogue, London, South Kensington Museum. (London, 1862) cat. no. 3001. Browne, Clare; Davies, Glyn; Michael, M.A., English Medieval Embroidery: Opus Anglicanum , exhibition catalogue, London, Victoria and Albert Museum (London, 2016), cat. no. 33, p.165.